Karen Deane Scoresby passed away February 2, 2018 after a 19-month battle with glioblastoma multiforme brain cancer. Karen was born in Burbank, California on January 23, 1966 to Dean Werner and Suzann Upstill. When Karen was still a baby, her family moved to Mesa, Arizona. Karen attended Hawthorne Elementary School, Poston Junior High, and Mountain View High School, graduating in 1984. In high school, Karen was active in church, cheer, pom and dance. 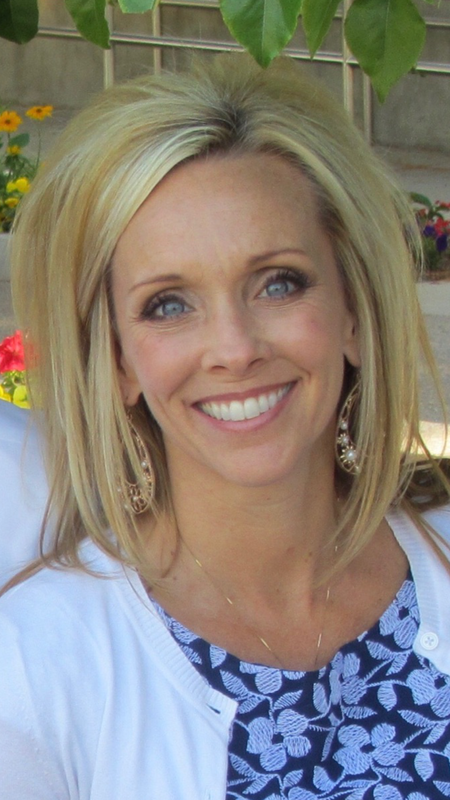 Karen attended Brigham Young University after high school until 1986. She married Kyle Scoresby, also of Mesa, on April 24, 1986. They had four children. Karen loved being a mother and serving in her church and community, especially with children and youth. In addition to teaching her own children to read at young ages, Karen taught several other children to read as a volunteer tutor at her children’s school. Karen had a way of making others feel loved and important. In church she often had friends’ children come sit with her, drawing them in with her Jolly Rancher stash and making them feel special with her hugs and kind words and actions. Karen was an avid runner and hiker. She completed five marathons, including the prestigious Boston Marathon in 2011. Karen hiked the Grand Canyon “rim-to-rim” three times. She loved socializing with friends as they ran, hiked and did cross-fit together. Karen loved glam and fashion. An expert in the art of back-combing, Karen usually wore tall hair and tall shoes. Karen loved life and had many friends. She had a quick sense of humor and a contagious laugh. She was known to her friends and family as a happy person in any circumstances—always an optimist. Even after her brain cancer diagnosis, Karen remained positive and grateful to her Heavenly Father for her blessings. She touched the lives of her “Karensitters” and the many others who came to visit her after she was sick and needed assistance. Karen remained faithful and grateful to the end. She passed away peacefully at home with her family at her side. Karen is survived by her husband, Kyle Scoresby; by her parents, Dean and Sue Werner; by her four children Emily Merrell (Andrew), Blake (Christy), Kade and Annie; her granddaughter, Avery Karen, and by her sister, Becky Mills and her brothers Evan and Grady. She will be dearly missed by her family and all who knew her. A visitation will be held Friday, February 9, 2018, from 6:00 pm until 8:00 pm, with the funeral on Saturday, February 10, 2018 at 10:00 am (visitation at 9:00 am). The visitations and funeral will be held at the L.D.S. church building at 2424 N. Old Gilbert Rd., Mesa, AZ 85213. Bunker’s Garden Chapel is handling all arrangements and accepting any flower deliveries: 33 N. Centennial Way, Mesa, AZ 85201, 480-964-8686. I am so sorry for your loss. Karen is such a beautiful person in many ways. We will miss her kindness, because she was truly one of the kindest people we know. We love you guys! My deep condolences to the Scoresby family, I was really touched by the loss of your loved one. When a precious loved one falls asleep in death, it brings to mind God’s precious son Jesus. It is comforting to note how he viewed death. I would like to share it with you from the gift that the Most High God has given to each & everyone of us. His written word the Bible in the Book of John chapter 11 verses 11-14. My Condolences to to the Scoresby and Werner family. Karen was a good friend to all who knew her. Even after 20 plus years when I saw her at the Temple, she talked to me like we had been in regular contact. She is a blessing not only to her family but to all who knew her. May our Savoir’s love be with you at this time and help you heal. I am truly sorry for your loss, please accept my sincere condolences. I hope the Scoresby family will find some comfort and strength in Jesus promise of the earthly resurrection (John 5:28, 29) and the renewed Paradise earth, where death is an enemy (1 Corinthians 15:26) that will very soon be eliminated forever, and no family will mourn the death of a loved one (Revelation 21:4). This promise has been given by Almighty God Jehovah (Psalms 83:18). Truly, what a glorious and almost unbelievable day that will be! It’s a reality though for God cannot lie (Titus 1:2).